It has been a very busy April. At the beginning of the month I was away for the weekend at the Guild of One-Name Studies conference in Boorley Green, Southampton. Who Do You Think You Are? 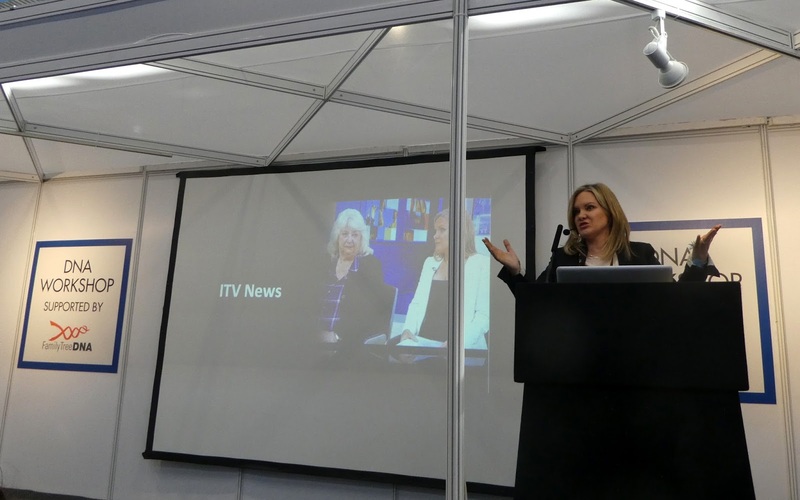 Live was held the following weekend at the NEC in Birmingham. We then went away for a short family break in Dorset. As a result I've had a lot of catching up to do and I've only just had the chance to do my usual write-up of WDYTYA Live. WDYTYA is always the highlight of the genealogical calendar in the UK. It's the largest family history show in the UK and in Europe, and is the one event that is not to be missed. It's always good to catch up with friends, and meet new people, but three days is never enough, especially when you are giving talks, organising speakers and helping out on a stand. There were many people I would like to have seen but didn't get a chance to speak to. 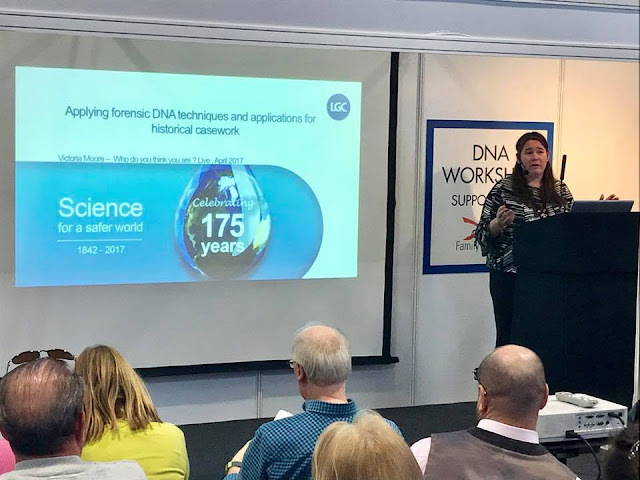 In one of my volunteer roles for ISOGG (the International Society of Genetic Genealogy) I once again helped to organise the lecture schedule for the DNA workshop. 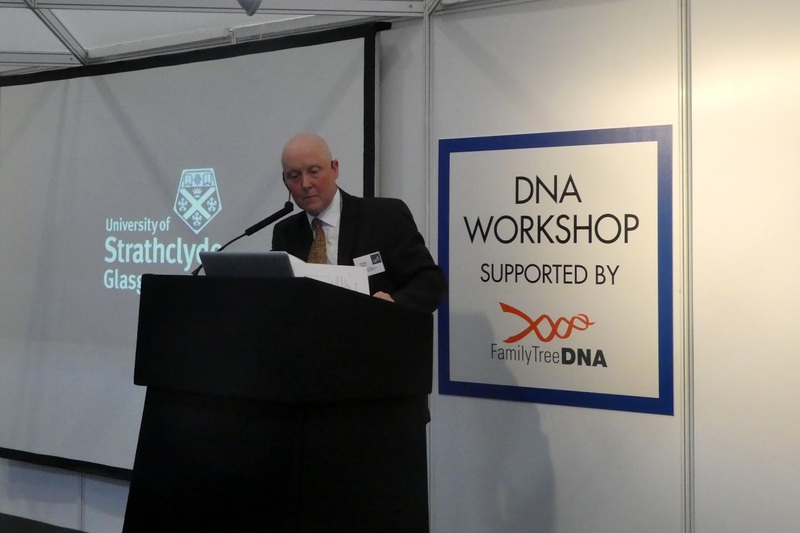 Family Tree DNA very kindly provided sponsorship for the lecture theatre. We had another great line-up of speakers. We are very grateful to the genetic genealogists and academics who gave so generously of their free time, and especially so as none of the speakers receives an honorarium or reimbursement of expenses. Thanks to the sterling efforts of Maurice Gleeson, most of the talks have been recorded and will be uploaded to the Who Do You Think You Are? DNA Lectures channel on YouTube over the course of the next couple of weeks. 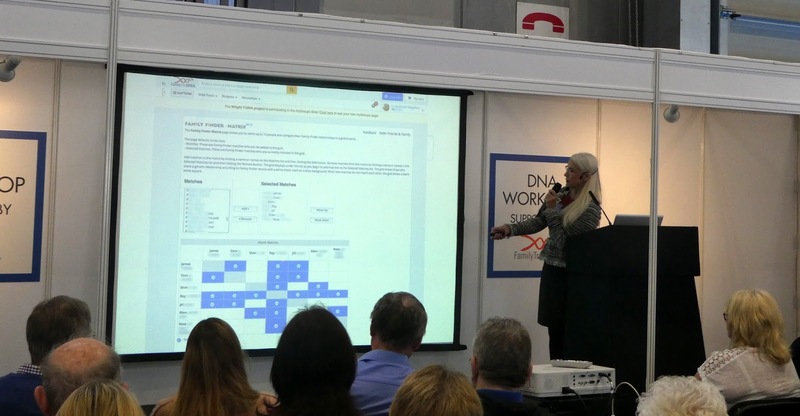 To get an idea of the delights in store you can check out the DNA lecture schedule here. I presented a talk on autosomal DNA demystified, and was very pleased that Tony Wood, a member of my Devon DNA Project, was able to join me and share his story with the audience. Tony has been using both Y-DNA and autosomal DNA to try to identify the father of his illegitimate great-grandfather James Polyblank Wood. James was born on 15th July 1870 in Kingsbridge Union Workhouse in Devon and was the son of Sarah Wood. Previously genealogists would struggle to identify the father in such situations but genetic genealogy is now starting to provide answers. Tony belongs to haplogroup N-P189.2, which is rarely seen in the for UK and occurs today at the highest frequency in Serbia. 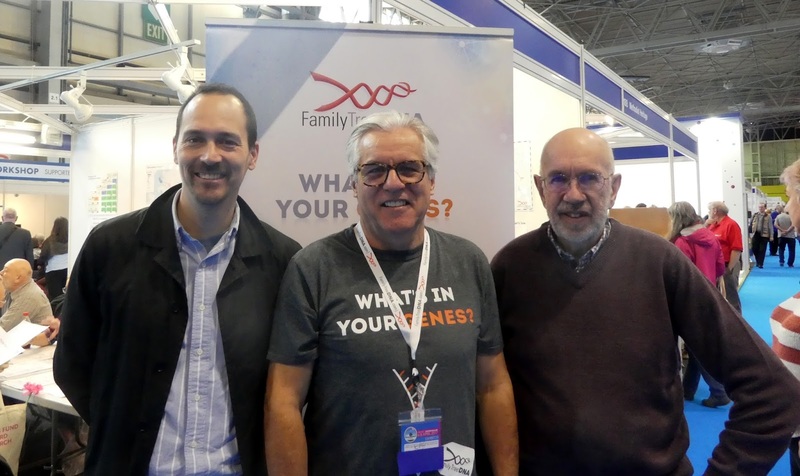 Uros Uzelac, the volunteer administrator of the Haplogroup N-P189.2 Project at Family Tree DNA, has taken a special interest in Tony's Y-DNA results, and was able to come along to WDYTYA to meet Tony. The photo below shows Tony and Uros meeting Max Blankfeld, Vice President of Operations and Marketing at Family Tree DNA. 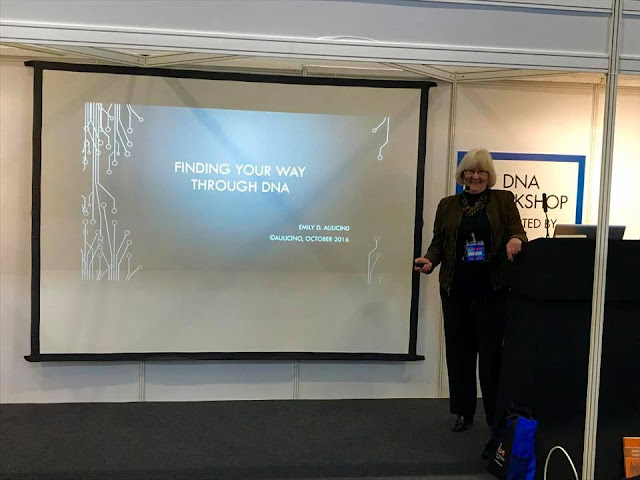 DNA testing had a major presence at WDYTYA this year and seemed to be a major topic of conversation. 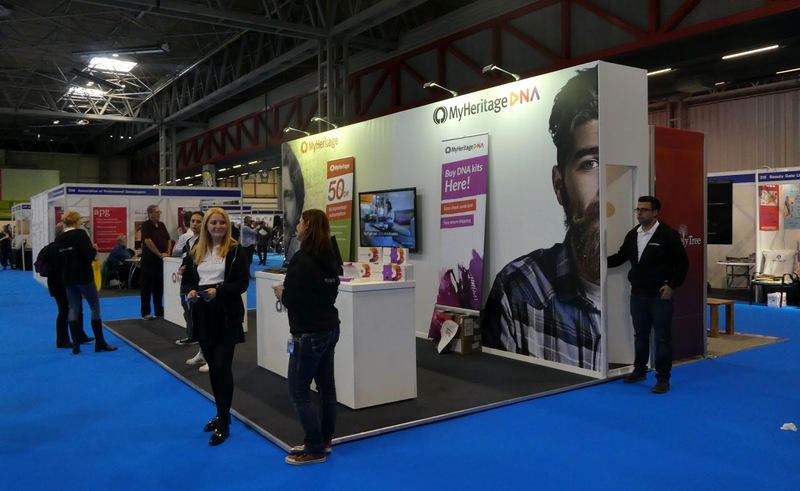 There were four companies selling DNA tests: Family Tree DNA, AncestryDNA, Living DNA and MyHeritage DNA. All the companies had special show prices, and there were lots of people stocking up and buying multiple DNA kits. We can look forward to many more matches once these tests have been processed. BritainsDNA (now trading under the name MyDNA.Global) were noticeable for their absence for the second year running. 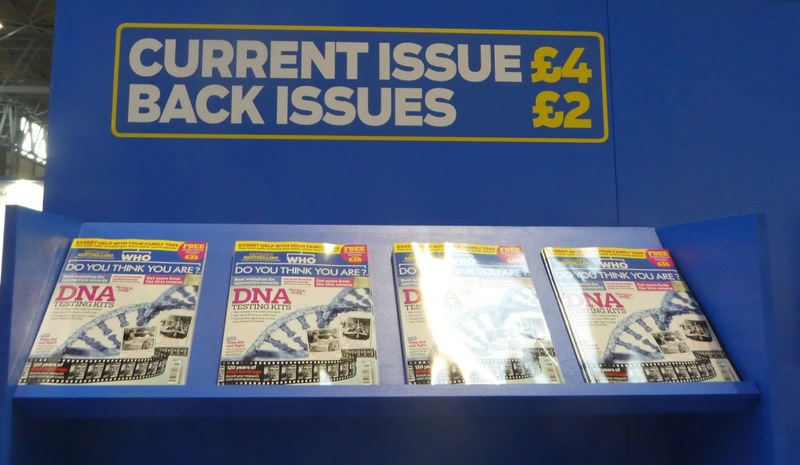 I'd written a buyer's guide to DNA testing for the May issue of Who Do You Think You Are? Magazine. With immaculate timing early issues of the magazine had arrived at the NEC just in time for the opening. I was delighted to discover that my article is featured on the front cover. There is a preview of my article on the WDYTYA Magazine website but you'll need to buy the magazine to see the testing company comparisons. Family Tree DNA had a stand opposite the DNA lecture area. The were selling their Family Finder test for just £40, and had special offers on their Y-DNA and mtDNA tests too. The BigY test was on sale for existing customers, and a number of people took the opportunity to upgrade their kits. There seemed to be a constant crowd of people around the FTDNA stand. I was delighted to see Princess Maria Sviatopolk-Mirski again. We first met at WDYTYA Live in 2010 when the show was held at Olympia in London. I wrote about Princess Maria's interesting mtDNA results here. She had made a special visit to WDYTYA so that she could upgrade her mtDNA test to the full mitochondrial sequence. She belongs to the very rare haplogroup R0a, and it will be interesting to see what her full sequence test reveals. Living DNA had by far and away the most impressive stand at the show with a big flashing screen with an ever-changing array of images. 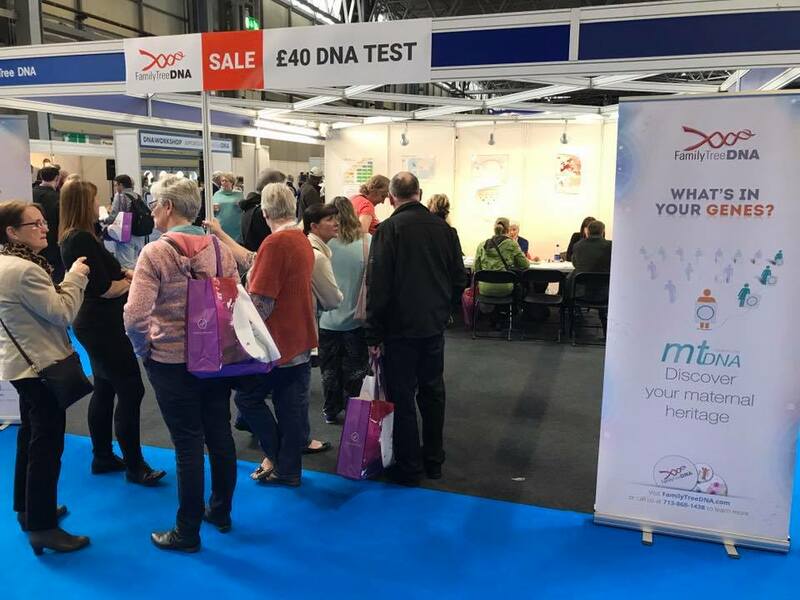 They were selling their DNA test for £99, and seemed to be attracting a lot of interest. The Irish grandparents' project has been going well. They have collected about 1200 samples, and an update should be ready in the next month or so. Living DNA have now launched a German DNA Project. For details see my blog post A DNA Day sale at Living DNA and the launch of a new German People Project. A Scottish Project is due to launch in June. They are hoping to do similar projects in other European countries. Autosomal matching is being worked on, and two different systems are currently being tested. The autosomal transfers will be coming in two to three months' time for a fee. They want to make sharing and transferring from other companies very easy. The idea is that it would be done with a quick click through. Living DNA hope to collaborate with other companies on trees rather than coming up with their own system. Raw data downloads should be available in the next few months. They are still in the process of validating all the data from the new Illumina GSA chip. 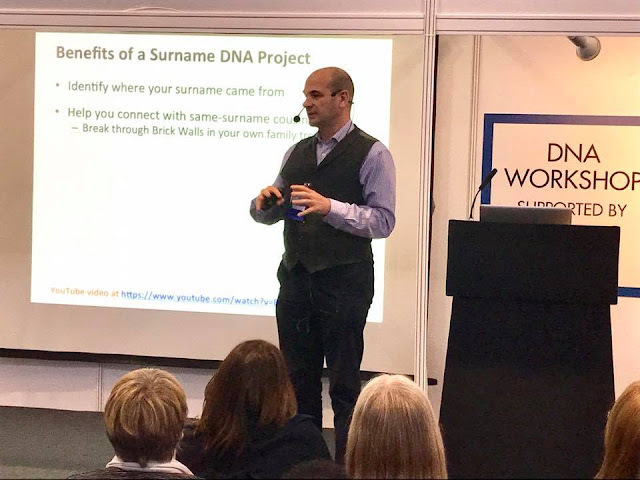 Nick Thorne, the "Nosey Genealogist", did an interview with David Nicholson of Living DNA which can be seen on YouTube. 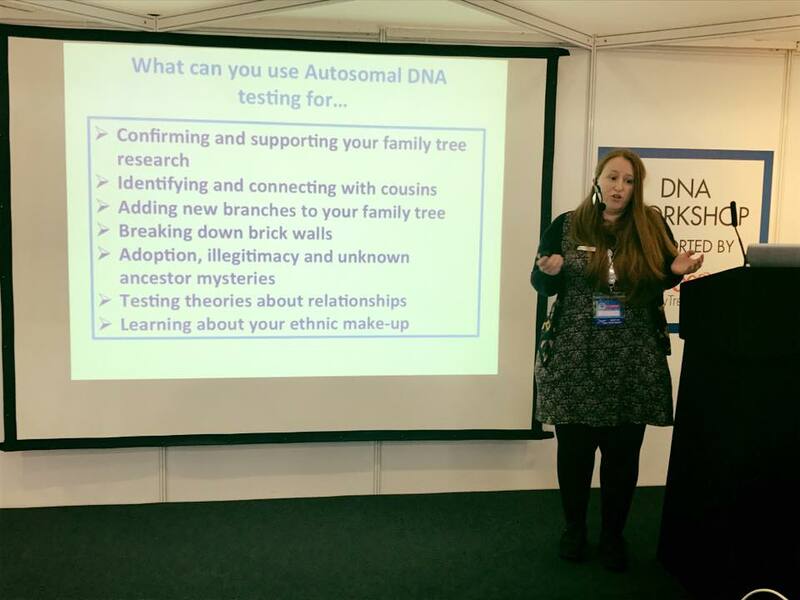 AncestryDNA had a major presence at WDYTYA, and were the overall sponsor of the show. They sponsored the lectures in the Celebrity Theatre, which included two DNA lectures each day. The AncestryDNA test was on sale for just £49, which was a huge saving on the usual price of £79. 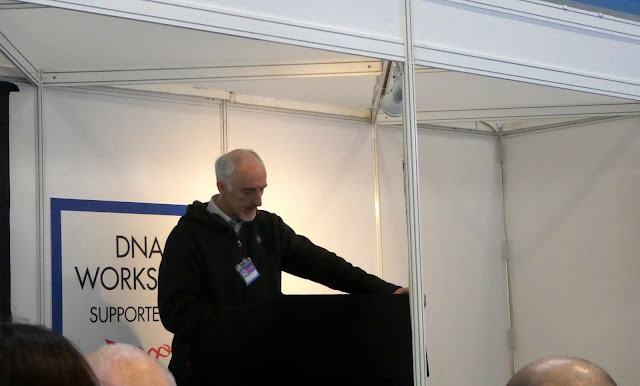 By picking up kits at the show visitors were also able to save on the £20 shipping fee. There seemed to be a lot of people buying multiple Ancestry kits to test their friends and relatives. New communities will be added as they are identified rather than being rolled out all once in a big upgrade. Ancestry apply a special algorithm known as Timber to downweight "pile-up regions" (sections of the genome where large numbers of people match as a result of shared human history, shared population history or some other reason). Timber wasn't mentioned in the scientific paper but I received confirmation that Timber is applied before the communities are identified. The communities work with the match data which means that the feature is only applied after the phasing and IBD identification has already taken place. 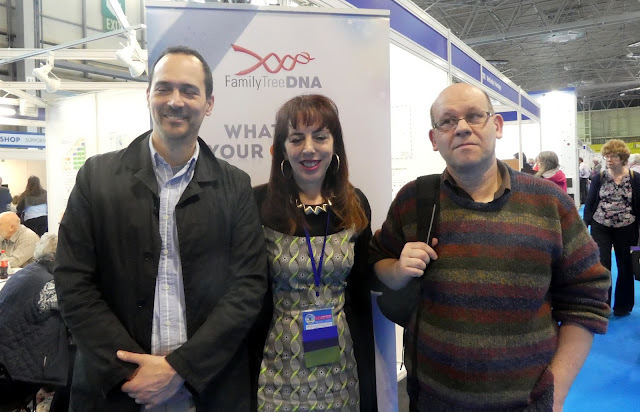 I paid a visit to the MyHeritage DNA stand and had a chat with Daniel Horowitz, their Chief Genealogical Officer. I've taken advantage of the free autosomal DNA transfer to MyHeritage. At the moment the transfers are not receiving admixture reports but Daniel very kindly gave me a sneak preview of my own report. He explained that these results are not being rolled out to the people who've done the transfers. The company have been collecting reference samples and are working on providing regional breakdowns. The transfer kits will receive an admixture report once the regional breakdowns are ready to be rolled out. They are also trying to work on a chromosome browser. I've had a lot of problems with the MyHeritage trees. I'd previously received a free three-year PremiumPlus MyHeritage subscription courtesy of a special offer from the Guild of One-Name Studies. However, once this offer expired I found that I was locked out of my account because I'd added more than 250 people to my tree. In order to transfer my DNA to MyHeritage I had to set up a new account under a different e-mail address. Daniel merged the two accounts together for me and very kindly gave me a free MyHeritage PremiumPlus subscription in consideration of my status as a "DNA expert". 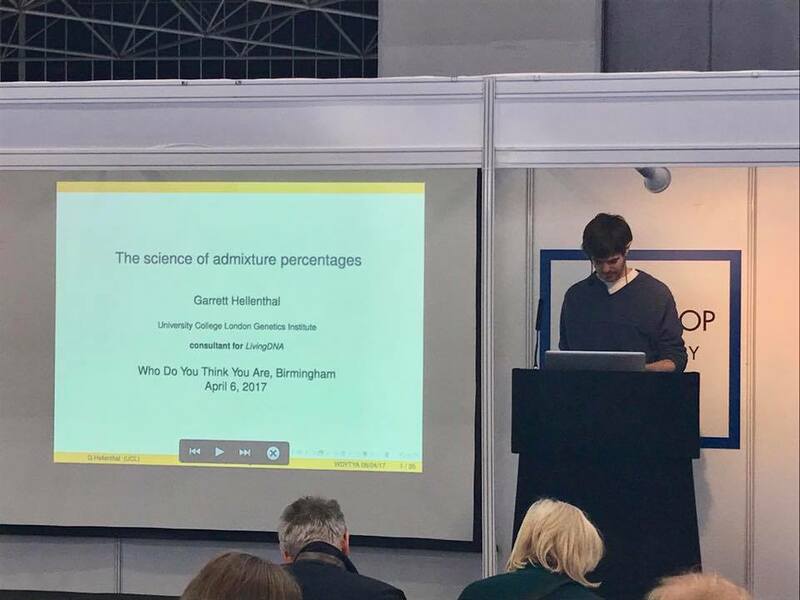 I've not yet seen the figures for the attendance at this year's show but it was my impression and that of other people I spoke to that the numbers were down on last year. 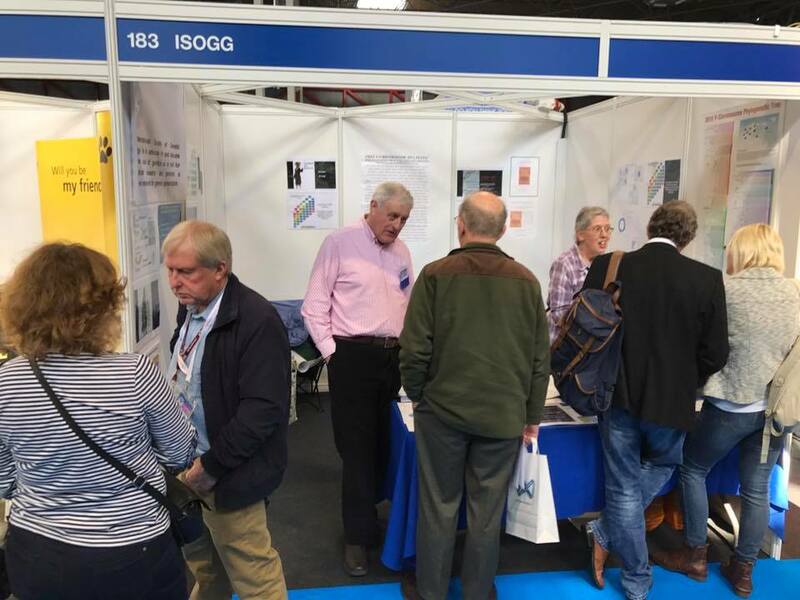 A number of exhibitors from last year did not make the return trip including big names like The National Archives, Eneclann, and the National Library and Archives of Ireland. 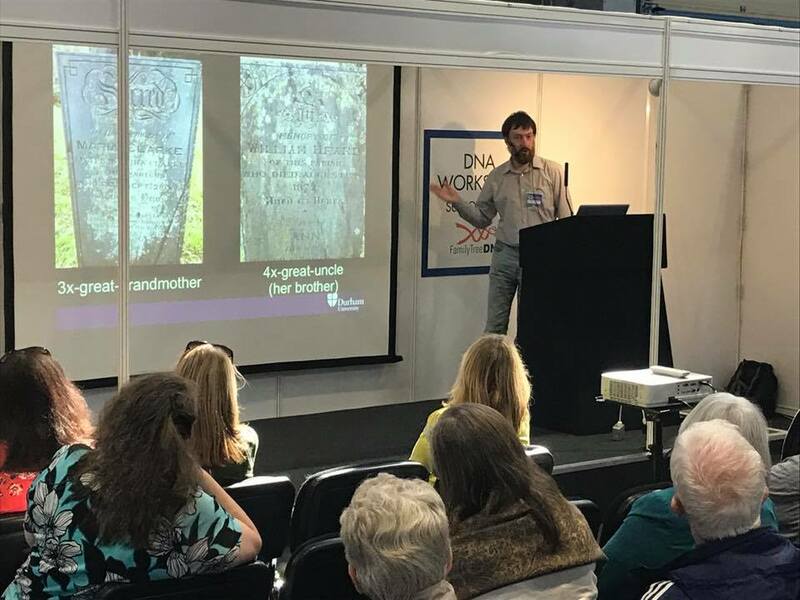 A number of family history societies who attended last year were also missing this year including the Gloucestershire Family History Society, the Hampshire Genealogical Society, the Huguenot Society, the Jersey Family History Forum, the Peterborough and District FHS and the Wharfedale FHS. There seemed to be more stands than usual given over to charities, most of which seemed to be related to dogs and cats. Perhaps they think family historians are more likely to be pet owners. Presumably these charities were given discounts to fill up some of the spaces but it would have been better to offer reduced rates to the family history societies who often struggle to pay the high costs of a stand at the show. In addition they have to pay travel expenses and provide accommodation for their volunteers so that they can man their stands for three days. I also think that the organisers could do a lot more to advertise the show, particularly in the national press. The NEC has a spacious comfortable exhibition hall with good facilities but the venue is in the middle of a large industrial estate which is totally lacking in atmosphere and designed for cars not pedestrians. Because so many people travel to Birmingham by car or by bus, they all leave early to avoid the rush hour traffic so by mid afternoon each day the crowds start to thin out, and it becomes very quiet. I know some people prefer being in Birmingham but I would much rather that WDYTYA returned to London. Who Do You Think You Are? 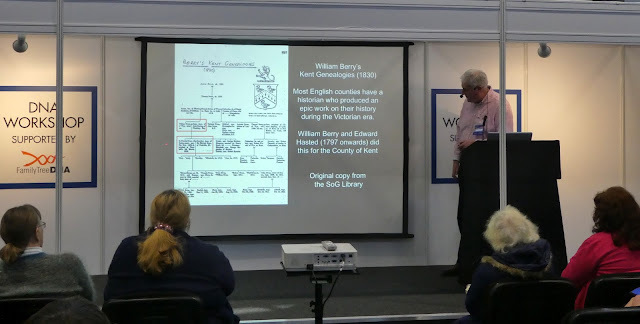 Live 2017 by Daniel, The Genealogy Corner, 9 April 2017. So, who do we think we are? The future of genealogy events in the UK by Erin Tilley, Census Sensibility, 5 May 2017. So, who do we think we are? 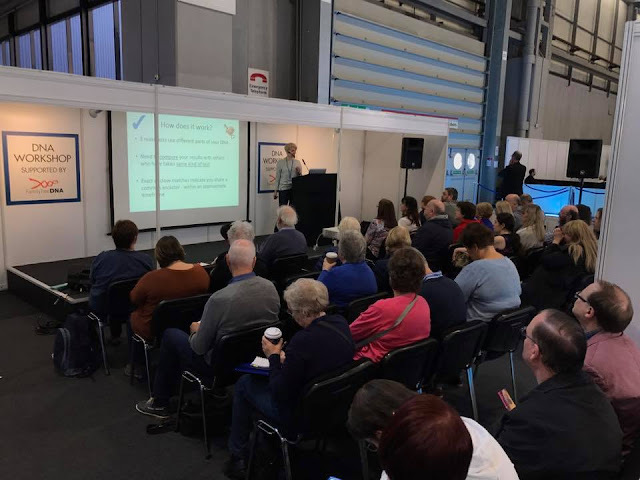 The future of genealogy events in the UK Part 2 by Erin Tilley, Census Sensibility, 8 May 2017. Speakers' handouts and slides from some of the lectures presented in the SOG workshops are available on the SOG website. Who Do You Think You Are? 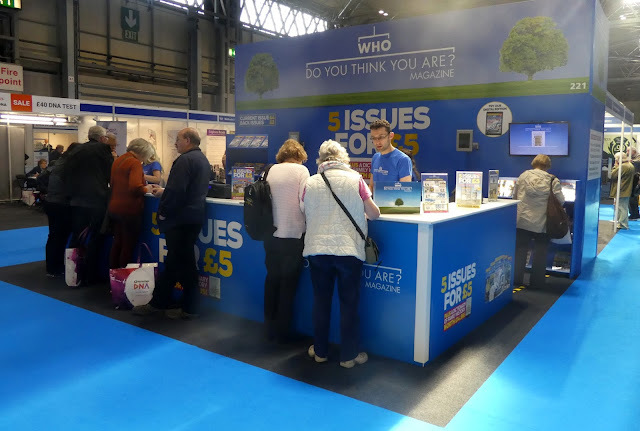 Live will take place next year from 26th to 28th April 2018 at the NEC, Birmingham, so put the dates in your diary now. See you all there! In the meantime you can enjoy some more photos from this year's show below. Immediate Media have announced that Who Do You Think You Are? Live will no longer take place for "financial reasons". The event has been running at a considerable loss and it has not been possible to bring into profit. See this blog post from Who Do You Think You Are Magazine for further details. The Society of Genealogists are hoping to arrange a replacement event. See the SOG blog for further information. 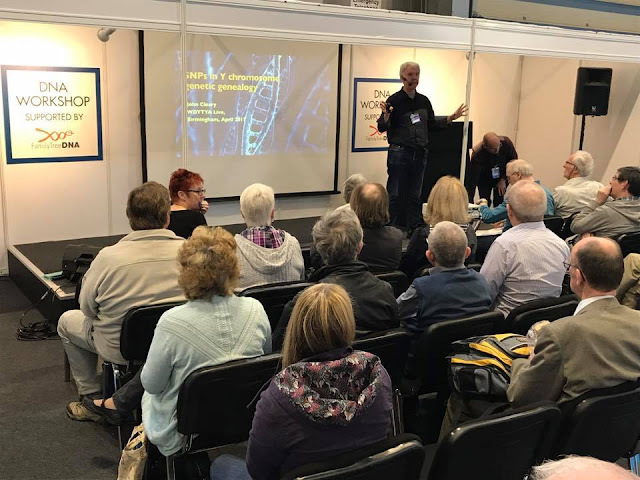 I've been advised by Else Churchill of the Society of Genealogists that attendance this year was 13,500 which was slightly up on last year, but clearly not enough to make a difference. The long queue of people outside the NEC waiting for the doors to open. Garrett Hellenthal - The science of admixture percentages. Photo by Joss ar Gall. Maurice Gleeson - Researching your surname with Y-DNA. Photo by Joss ar Gall. Emily Aulicino - Finding your way through DNA. Photo by Joss ar Gall. John Cleary - What is SNP testing and how can it enhance a Y DNA surname or genealogy project? Photo by Joss ar Gall. 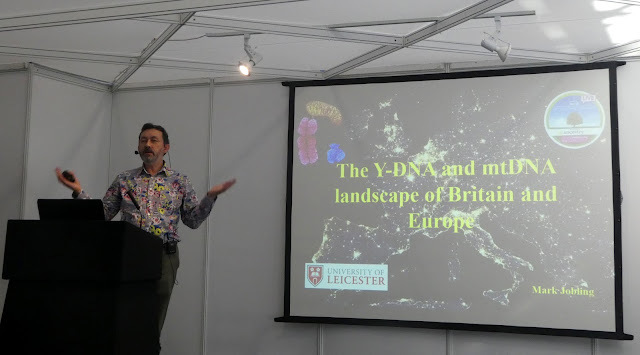 Mark Thomas - Ancient DNA and British genetic history. Victoria Moore - Applying forensic DNA techniques and applications to historical casework. Photo by Joss ar Gall. The Guild of One-Name Studies stand. From left to right: Peggy Homans Chapman, Geoff Giles, Paul Featherstone, Sue Swalwell and Cliff Kemball. 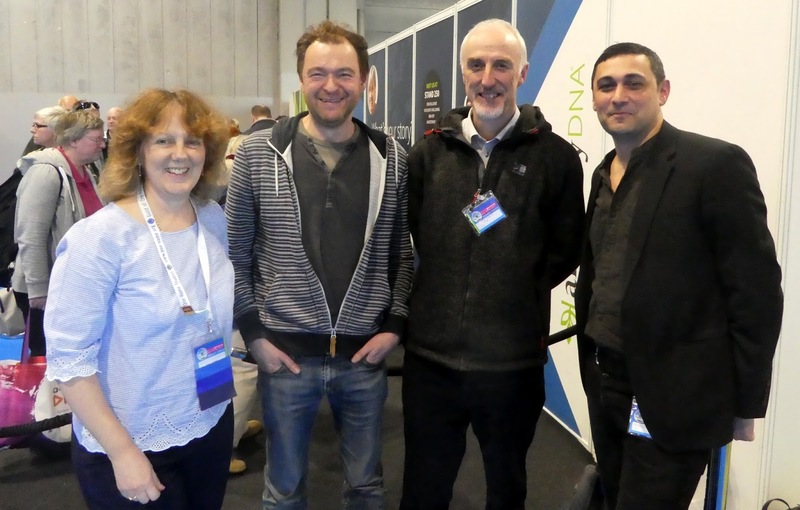 Katherine Borges, Director of ISOGG with (left) Uros Uzelac, group administrator, N-P189.2 Project, and Gareth Henson, group administrator, Haplogroup T Project, and a member of the ISOGG SNP tree team. 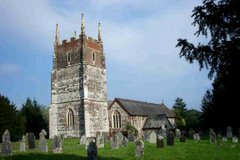 The Devon Family History Society's stand. The ISOGG stand. Photo by Joss ar Gall. Who Do You Think You Are? Magazine. Thanks for such a comprehensive report Debbie. With the addition of those beaut photos it made me feel like I was there. Thank you Jill. It's just a shame that this is the last ever WDYTYA. I do hope the SOG will be able to come up with a suitable alternative event.